The CHUWI Vi10 Plus tablet has high performance Trail Z8300 Quad core CPU, excellent processing platform, 10.8 inch multipoint capacitive touch screen with resolution 1920 * 1280 pixels, sensitive respond and 2GB RAM, 32GB capacity. 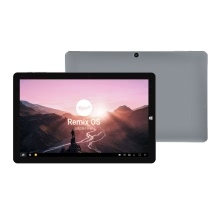 Remix OS 2.0 combines some features of windows and android. It has more application selection than windows. It can reduce the pressure for your knapsack. Vi10 plus with metal full body. It is the stepping stone to make your homework effecient. Steadiness means rapidness and efficiency. Dual cameras: 2MP front and 2MP rear camera. Support Bluetooth 4.0, G-sensor, etc. Language Portuguese, Spanish, Russian, German, Italian, English, Dutch, French. Note: If you need any specific language other than English and you must leave us a message when you checkout.